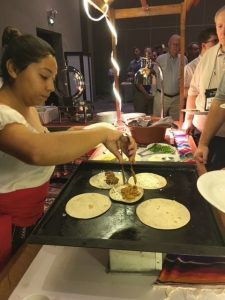 The Culinary Aspects of Corporate Meetings | HPM Associates, Inc.
A large part of planning a business meeting is making sure the food served enhances the entire experience. The food portion of a corporate event often determines its overall atmosphere and success. If you are responsible for hosting business meetings, don’t forget the importance of well-planned menus. One thing that HPM Associates can do well is find restaurants within whatever location we’re given which is an important part of planning a successful business meeting! If you need to hold a meeting in a small city, it’s important to find fitting restaurant locations ahead of time. Many restaurants located in remote towns are gems but you’ll need to dig for them; let us do the digging for you! Food is often the highlight of a trip, and it’s important to impress guests regardless of where you’re hosting them. Doing a weekend conference and want to provide some source of entertainment through cuisine? Consider hosting a themed dinner. HPM Associates has done this several times and they are a no-fail option to get people acquainted. Use themed invitations, cuisine, decorations, entertainment, and more in order to set the stage for your guests. Hosting a dinner creates a comfortable setting where employees can unwind and exchange ideas, leading to closer connections. 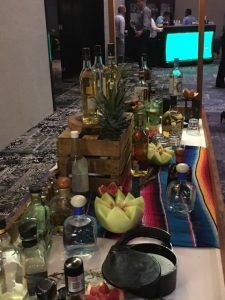 We recently hosted a dinner with a “Mexican Fiesta” theme where we served Mexican themed food, had a Mexican coffee station, a full tequila station, a Mariachi Band, and more. The problem that often arises with serving food at a business meeting is that people have specific eating preferences, making it difficult to accommodate large groups. In order to meet the tastes and diet requirements of multiple people, consider serving food “buffet bar” style. A salad bar, for instance, will allow everyone to customize a salad to meet their preferences. Consider serving romaine, spring and spinach along with several dressing options and a variety of interesting vegetables to make the salads more appealing. You might want to also consider items such chopped egg, cheeses, meats, chicken or shrimp. Most people host lunch oriented business meetings which can help to simplify the menu. However, serving breakfast at an early business meeting is also a great option. Many professionals skip breakfast, especially when traveling. By combining your morning meeting with breakfast it will help you to save time, money and create a better agenda. Eating breakfast can also help improve mood, energy level, and ability to focus. Serve breakfast at an early business meeting in order to keep employees inspired; just make sure that there is plenty of coffee. Need help planning a business meeting with a delicious food selection or finding options on the road? HPM Associates excels in meeting planning, incentive travel, venue selection, and destination services.